I locked eyes with this plaid shirt from across the store and fell in love instantly. Big bows never fail to win me over! The sunny yellow paired with the robin's egg blue is just so unabashedly sweet and springy. That's just I'm in the mood for right now. Thanks for all of your great questions! I'll do an answers post either over the weekend or on Monday. i love the colorful top. wow i love your new hair. AM sorry too late to notice. The big bow on your shirt makes your outfit. It's so cute. And the fact that you got hose amazing shoes for $18 is a miracle. I love your hair! You look like a 60s muse. You look great Katy. so pretty! perfect for spring. those shoes are so intense! i love them paired with the springy colors. Your shopping skill amazes me. Beautiful top. Can't believe it was only $10. what a fun color combo! And btw, your new 'do looks so chic! WOW. Okay, this is my fav outfit of yours ever. I am seriously in love. LOVE. again! how do you do it! and still digging that hair. and i meant to say last time thanks for stopping by my blog! I have been loving a lot of little girl dresses and tops lately. Why don't they make the same dresses for adults!!!! Great look.. Your outfits keep getting prettier and prettier!! Oh, you know you are ready for spring in this lil number. Great color contrasts! I love the cream color of the shoes. Great style. Big bows are very enticing. I love how it is in the front. I love your outfit and I see why you love your shirt, it's absolutely adorable.And your shoes are too cute I love gray foot wear and they ground your outfit well. your shoes are fierce and i can't believe you got them for 18 bucks! 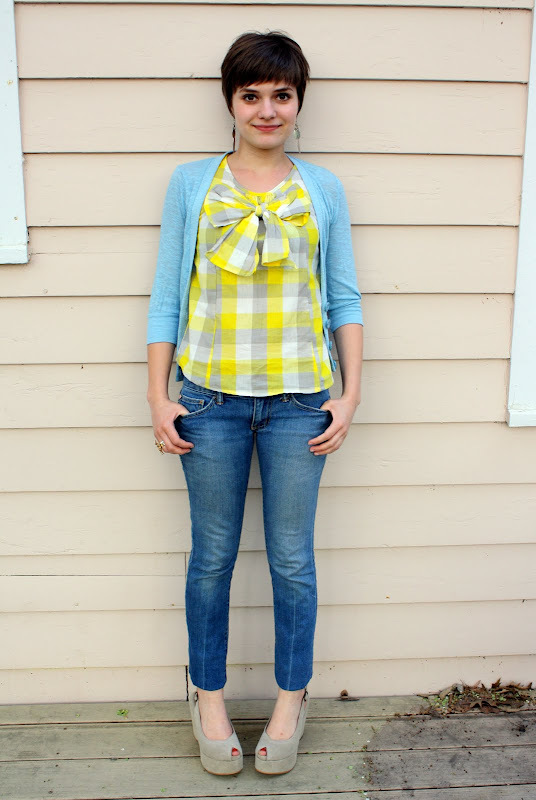 This yellow plaid shirt is gorgeous! And I don't know if I mentioned it yet, but I really love your new hair cut. It suits you well. I think that I am in love with this shirt too! This outfit is perfectly spring! And that bow is definitely an eyecatcher. Love! Love that top! Super sweet paired with the baby blue cardigan! Sooo cute and springy!! I love it! Love everything about this outfit. So cute! you are rockin' this outfit! That is such a great plaid shirt! I love it, so cute! This is such a cute picture! I love the bright springy colors. What a cute top! Love everything about it..the color, the plaid and especially the big bow. beyond freakin' cute! bright colors look amazing on you! Wonderful colors! Would you mind if I featured this photo in my blog as a great usage of plaid? Shoot me an email at: likesquarepolkadots@gmail.com if you have any questions/concerns! !